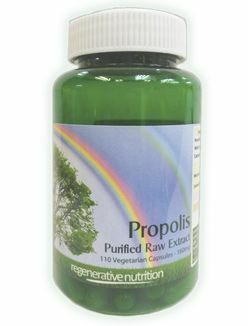 Purified Raw Propolis 160 mg.
* Exceeds the industries minimum standards for the flavanoid markers pinocembrin & galangin. Maintenance Use: 3 capsules daily. Propolis is free from any side effects and has been in use for at least 3,000 years. Its use was recorded in ancient Greece, Rome and Egypt. Allergies, Asthma, Arthritis, Angina, Acne, Blood Pressure (high) Bone healing, Bronchitis, Burns, Candida Albicans infections, Colds, Dental problems (pain from mouth ulcers), Eczema, Gastric Ulcers, Gastrointestinal infections and parasites, Goitre, Gum infections, Hay Fever, Immune System (under or over active conditions), Influenza, Infection of many kinds, Irradiation (AIDS resistance to), Lung conditions, M.E. (chronic fatigue), Sclerosis, Nails and hair growth, Peptic Ulcers, Rheumatoid Arthritis. Propolis is a sticky substance secreted from the bark and buds of trees (especially poplars) to protect the tree bud from environmental hazards such as moulds, fungi, and bacteria. Bees protect their hives from the same kind of dangers by collecting tree propolis. The bees mix the tree propolis with equivalent amounts of their salivary secretions and use the resultant "bee propolis" to coat the internal structure of their combs - rendering the interior of the hive one of the most sterile environments found in nature. Insects that find their way into the hive are coated with propolis - this has a preserving / mummifying effect, hence preventing bacterial or other contagion within the crowded hive. The thymus is a gland that helps to maintain a healthy immune system. It sits between the heart and the thyroid gland and from an energetic (i.e. traditional) standpoint it is related to the Life Essence. Dr John Diamond, President of the International Academy of Preventive Medicine, found propolis to be the best of all natural substances to strengthen the thymus gland and hence build up the body's health reservoir and resistance to disease, also possibly to mitigate the negative aspects of ageing. More relevant than the external (in vitro) tests are the long term effects of propolis consumption. Being an extremely complex biochemical compound (trees must be very clever!) it is broad spectrum in its effects. Unlike synthetic antibiotics, beneficial bacteria essential for human survival and health are not eliminated or compromised by propolis. Maintaining our friendly bacteria (of which there are several kilos in our gut!) is essential for proper nutrient assimilation and for the immune system. By taking propolis we can build up our resistance to colds, flu and other infections, but even if we leave it until we become infected, propolis is able to mitigate the worst effects of the infection (especially protecting the lungs). Dr Bert Hausteen from Kiel University in Germany, who has spent years researching propolis, says the bioflavonoids in propolis help to keep viruses inactive. A practical example comes from David Lloyd Williams, aged 72, of Powys, Wales who says: "For many years I suffered heavy colds, flu and bronchitis and antibiotics no longer seemed to help my chest problems... I took two capsules of propolis daily and within weeks my chest started to clear. I have only suffered one cold in the last 12 months and my bronchitis has completely cleared". Many other people have found help with chest conditions, e.g. asthma and bronchitis. In vitro studies have found propolis effective against TB germs that are now becoming resistant to conventional synthetic antibiotic treatment. Brent Harvey, a 28 year old that suffered from asthma since he was seven years old. After only four days of taking propolis he gained a full night's sleep without asthma for the first time in many, many months. The effects of Propolis extend far beyond the 'protection from invasion' role. Propolis is a significant aid to circulatory health. This is partly due to the presence of bioflavenoids (including the most potent of all O.P.C. - see the article on "Grape Seed O.P.C. Nature's most Potent Anti-Oxidant"). Chinese researchers have found Propolis effective in treating hypertension, arteriosclerosis and coronary heart disease. Bulgarian studies have shown good results in lowering high blood pressure. Understanding of the full role of the anti-oxidant and free radical scavenging effects of propolis will help us fathom some of the benefits of propolis. Most health disorders, especially those that come on with age, are in part due to free-radical damage, and it seems reasonable at this stage of knowledge to attribute the presence of anti-oxidant factors in propolis (i.e. the bioflavenoid content especially the O.P.C. fraction) as being responsible for many of the health benefits of propolis. Propolis has many natural healing properties; it aids the regeneration of bone, flesh and dental pulp. It has a long history of use for skin disorders such as eczema. Many studies have shown (e.g. in U.S.A., Poland and Russia) the beneficial effects of Propolis on a whole variety of other conditions, including fungal infections, psoriasis, dermatitis and acne. One test involved 59 patients who still had acne after several years of antibiotics, Dr Landon reports (using propolis ointment and tincture) that all patients were healed in one to three weeks; this was with acne simplex and acne pustulosa respectively. An example of eczema treatment was on a 15 month old Gregory Sheffield - his eczema disappeared after two applications of propolis cream over 48 hours. TB, asthma, eczema and hay fever are all related disorders according to homeopathic teachings. In view of this it is perhaps not so surprising that hay fever may respond positively to the use of propolis. Three patients are reported to have responded very favourably within eight days. Propolis also has anti-inflammatory properties. This, combined with its healing and immune balancing effects, may explain why it is also successful in alleviating rheumatism and arthritis in some individuals. (These disorders are so multi-causal that other treatments may also be required). Further indications that it encourages healthy cell growth are shown in the experience of some persons who report stronger nails and thicker hair after taking propolis. Propolis' action on the immune system and general well-being extends itself to so-called auto immune disorders. Studies at Oxford University have implicated propolis as being useful in the treatment of multiple sclerosis. (This is thought to be due to part of the body's defences attacking the nerve insulation sheaths). Rheumatoid arthritis is also thought to be an auto-immune disorder, yet both types of arthritis have been eased with propolis. M.E. (chronic fatigue syndrome) is a difficult condition to resolve and seems to display a disordered immune system, one half being underactive and the other half being overactive. Propolis does not seem to respect this difficulty! A trial was conducted on 27 patients who were chronically ill. After four months 24 had obtained major benefit. Some had responded dramatically within one week (this rapid effect has been also reported with O.P.C. ), others more slowly. (Studies have shown linseed oil and evening primrose oil would be a complementary remedy for M.E. sufferers). Propolis may also have a use in cancer prevention and treatment. Several studies have shown Propolis and its extracts inhibit the growth of cancer cells. In 1988 Cancer Researchers at Columbia University identified one of the active ingredients of Propolis, synthesised it and used it to either slow or completely stop the growth of a range of different types of cancer cells. It is unlikely that we will ever see Propolis supplied by our Health Service or prescribed by our GP since there is no significant money to be made from it. It is only by isolating and extracting particular chemicals from nature's complex products that a drug patent can be issued. Such a drug can reap rich rewards! Ironically, the rich diversity of the chemical structure of herb's and other natural remedies such as propolis will always have a superior effect on the totality of health of any individual than a single extracted substance (patented drug). "Propolis was found to have antibacterial activity against a range of commonly encountered cocci and gram positive bacteria including human tubercle bacillus.... These findings confirm previous reports of anti-microbial properties of this material, possibly attributable to its high flavenoid content". Dr Remy Chavin reported: "No other antibiotic has this total result on bacteria". Propolis raises the body's natural resistance to infection by stimulating its own immune system. Its anti-microbial properties are not confined to bacteria. Both in vitro and in vivo tests (laboratory cultures and tests on animals and humans) have shown propolis to be excellent at inhibiting the growth of many varieties of yeast including the common human parasite Candida Albicans (thought to be the common factor in most chronic immune disorders). Direct comparisons with nine (more narrow band) anti-fungal drugs on four specific fungi showed propolis to be equal to or better than them in its inhibitory effects. In short, propolis is an effective anti-fungal, anti-candidal agent that does not lose its effect with long term use. About 50% of propolis is a resin, 30% waxes, 10% essential oils, 5%. Pollen, also vitamins, minerals, bioflavenoids and flavenols, plus the bees' own secretions. The actual chemical composition is exceptionally complex and still being unfolded by laboratories around the world. At present it is generally assayed by its flavenoid content. Since the proportions of the various ingredients vary so much from hive to hive it is important to obtain a propolis that has been blended from many hives and then assayed. Propolis mainly comes as an extract - either hot water or hot alcohol extract. It is then dried and sold as a concentrate. The water extract is cheaper and much in general use, but many of the chemical trials have been done on the alcohol extract. Since these two types of extract contain some different ingredients it is therefore wise to obtain the full balanced profile of a raw propolis to provide a mixture of the two types of extract. Propolis has had its reputation tarnished by some suppliers providing sub-optimal amounts -as little as 10 milligrams per capsule/tablet. The general consensus is that an effective daily dose is around 1.5gms of the raw Propolis i.e. 375 milligrams of a four times concentrate. This was the quantity used in the M.E. trial discussed with persons relapsing when reducing to half gm daily. Russian doctors have used 9gms daily of raw propolis for periods after surgery with no apparent side effects. For long-term use it is recommended to experiment with dose using the 1.5gms as a guide. We all have differing needs at different times. VP Kivalkina, V.l. Gorshunova. Fitontsidy, Kazan Vetennary Inst, Kiev, USSR,. 1975. (Pg 3; Propolis Medicnl Data). DPA Kravcuf. Bestways Magazine, Nevada, USA. (Pg 50 Proyolis Medicnl Datn). A Stojko 1978. Department of Microbiology, Silesian Medical School, Poland. KD Woznick, W Bram. University Hautklinik, Germany 1972. R Chauvin 1980. Apiacta, Stn d'Ethologie, Mittainville, Raubaullet, France. Penny Hart. July 1987. Sunday Express.